Our Celtic cross resources are valuable whether you're studying the symbolism and history of the Celtic Cross or just looking for that perfect gift. Save time and money reviewing these resources. Unwrap the mystery of sacred Celtic crosses on Fantasy-Ireland. Discover why they symbolize the revolutionary union of ancient pagan beliefs with Christianity. Mr. Walker is an expert Celtic jewelry craftsman who also has many scholarly essays about various aspects of Celtic art, including the history of Celtic crosses. The title of his article, "Descriptions and Symbolism of Specific Historic Crosses from Ireland and Scotland" may be a bit long-winded, but it is only an indication of how seriously he takes the subject. If your quest is research and not artistic development, his article is an one of the most valuable Celtic cross resources available online. Mr. Keane is another accomplished Celtic jewelry artist who offers powerful insights into the symbolism of the Celtic cross and how it has evolved over the ages. Monsignor Eric R. Barr eloquently explains how the basic beliefs of Celtic spirituality can help many people who feel lost in mainstream Christianity find their place and focus their faith. This book is not specifically a Celtic cross resource, it is more a great resource for understanding Celtic Christianity's roots, which are well-symbolized by the Celtic Cross. 101 Celtic Crosses is written by one of the most highly respected Celtic artists of our time, Courtney Davis. It is an extremely valuable Celtic Cross resource from artistic and historical perspectives. Mr. Davis takes ancient designs of stone carvings and monuments and presents hand-painted interpretations for the modern Celtic artists to use in their own way. The beautiful, handcrafted pendant to your left is just one of many Celtic Cross designs available from My Celtic Jeweler from Ireland. 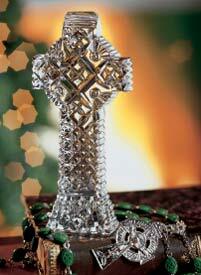 My Celtic Jeweler is an excellent Celtic Cross resource for gifts and jewelry. The quality of their merchandise is truly special. If you're living anywhere outside of Ireland or the UK, getting Celtic Crosses directly from merchants in Ireland quickly may be a tad expensive. But Creative Irish Gifts carries authentic Irish jewelry like the exquisite celtic cross to the left and is based in the United States. So if you live in the US or Canada, you'll get you're order much faster from them. The Celtic cross Bodhran Drums shown here are just one example of what nice Celtic cross gifts are available from Creative Irish Gifts. Creative Irish Gifts is also a merchant who gives generously to charity. So when you buy from them you can feel good knowing you are helping people in need. Creative Irish Gifts was founded in 1982 just to provide financial support to the Irish Children's Fund. This non-profit organization's mission is to work with at-risk children in the most troubled areas of Belfast. Because of Creative Irish Gifts, many of Northern Ireland's children who were most in danger of adding to their country's troubles later in life are living more confident, productive, and successful lives. And thanks to them, the people of Ireland and the world are more at peace. If you're looking for the perfect wedding gift for the Irish couple, consider the Waterford Crystal Celtic Cross to your right. Nothing says Irish quality quite like Waterford Crystal. There's simply nothing in the world that comes close to matching the quality and endurance it represents. As one of Ireland's finest exports, Waterford Crystal has become synonymous with fine crystal. And the Celtic Cross is one of the most universally recognized symbols of Ireland.